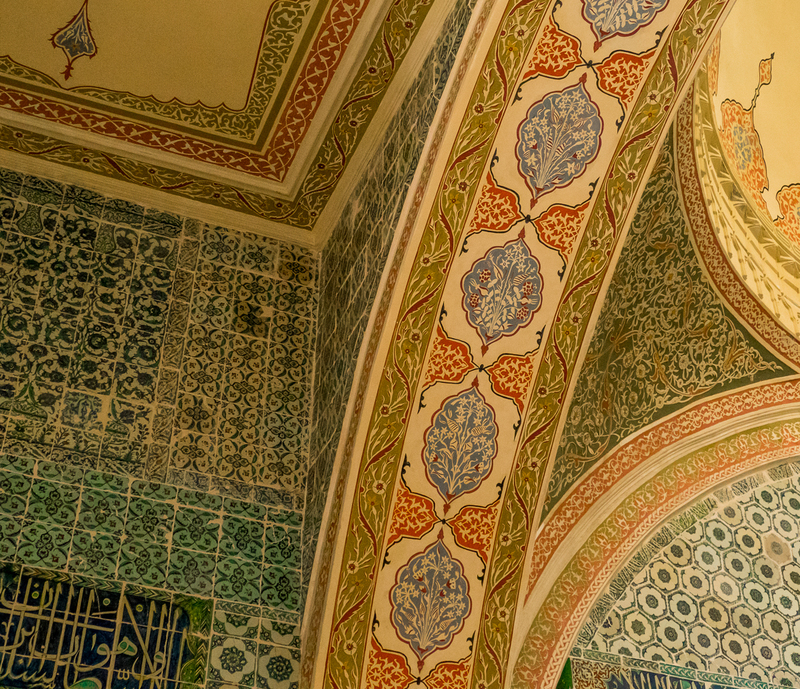 is the exquisite detailed beauty of the interiors of Topkapi Palace in Istanbul, Turkey. We are well, having a fine time in Jordan. Yes! Absolutely magnificent place, in the tradition of all grand palaces. So beautiful. Such love and dedication they must have put into the crafting of this building. 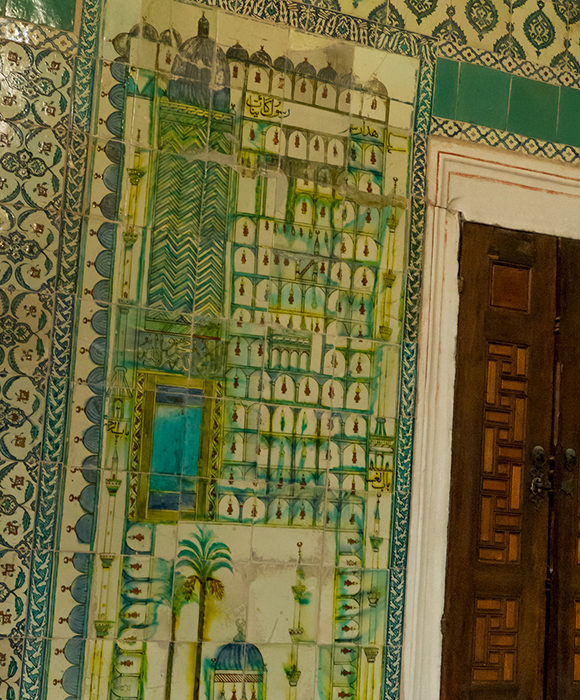 Each room filled me with joy as I thought about the people who actually created the tiles, and did the paintings. Such extraordinary creativity. We were definitely mesmerized. Every room a beauty. We were very glad we weren’t on a tour so we could really take our time. We spent 6 hours there. Awesome!!! You captured the beauty and intensity so well. Thanks Darlene, and yes it was definitely awesome! Love, love! 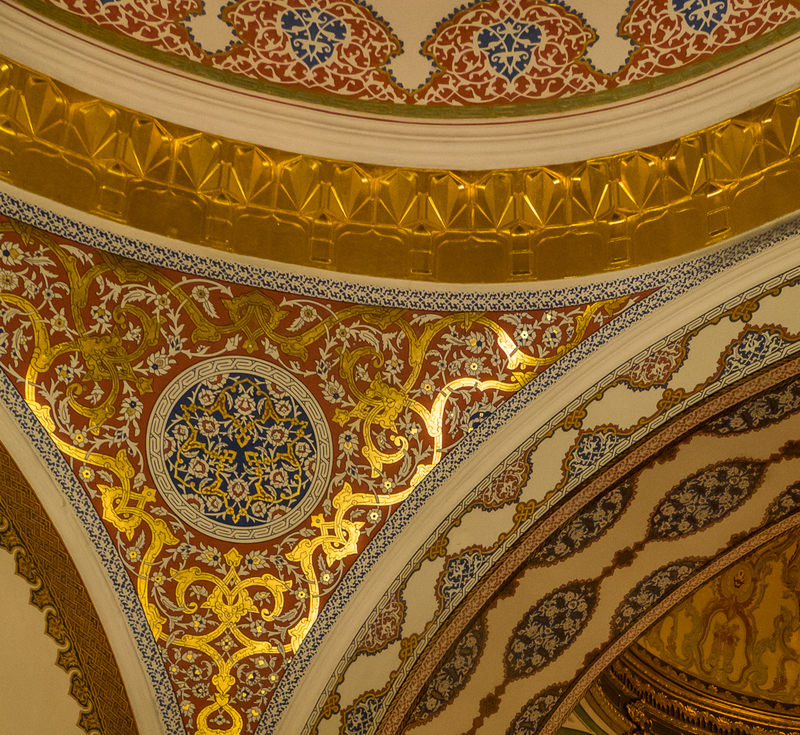 Topkapi exceeded my expectations and it looks like maybe yours, too. 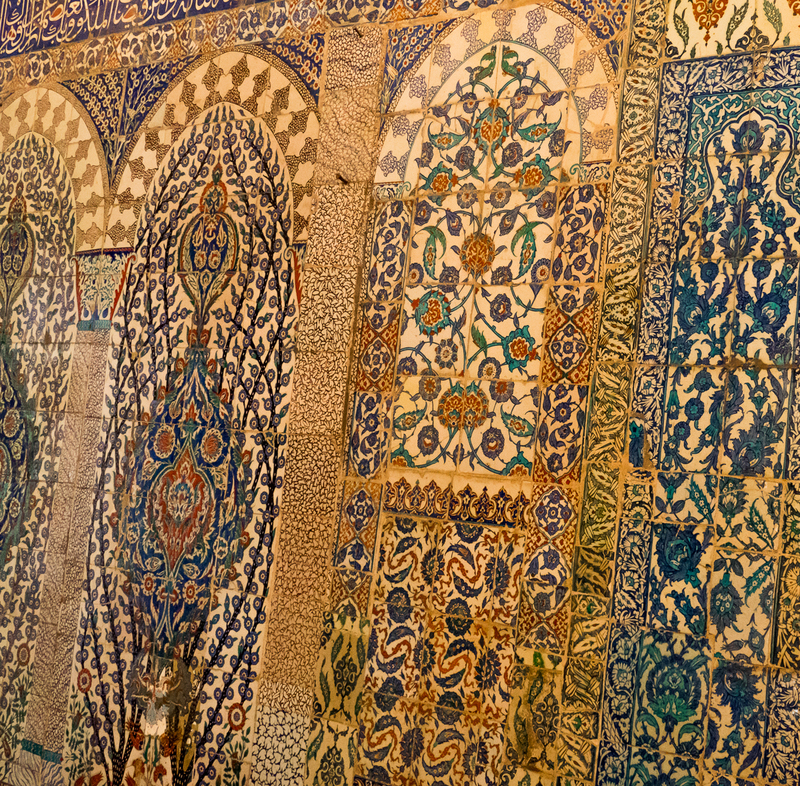 The tile work was so exquisite, especially in the harem, I thought. Other than your Pammukale water disappointment, I hope Turkey has been great! I think I spelled that wrong .. Pamukkale! Yes, we loved it to. Extraordinary place, that did indeed exceed our expectations. So very glad we went. Turkey was all wonderful except for Pamukkele – don’t know what happened there – lost our serendipity mojo for a couple of days 😦 but everything else was fabulous. Oh I do hope you get to go one day. It really is magnificent. I will be writing about both the blue mosque (Sultanahmet Cami) and Aya Sofia in later posts. Briefly – the blue mosque is magnificent, Aya Sofia is beyond shabby chic. It’s just plain shabby. We were very disappointed. I see adoration and love in every filigree, every luminous surface, every vibrant color. Yes, we were wowing a *lot*! Every room we walked into a new beauty. 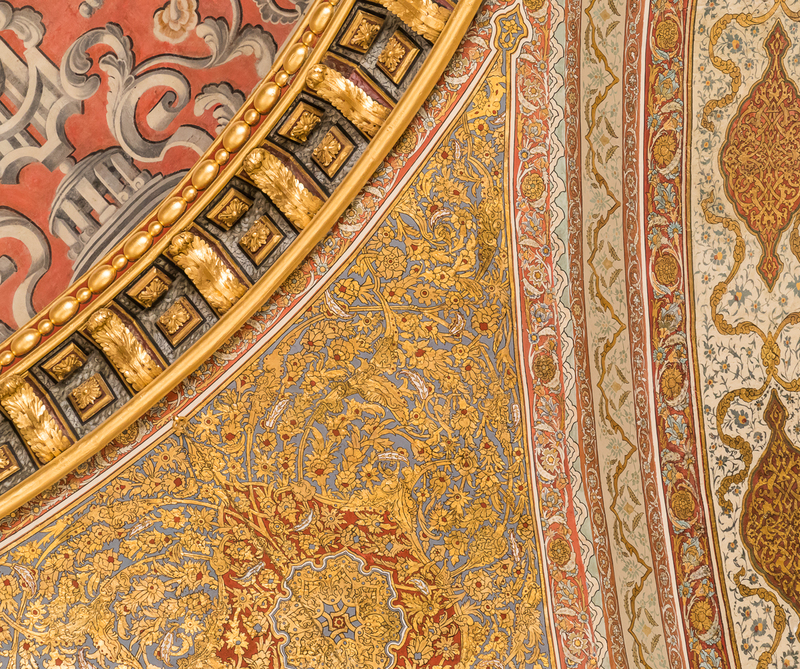 I thought often about the craftspeople who created this beauty, not the Sultans who commissioned it. Such incredible gifted artists. Thanks for taking me back to the beauty of this place. Wonderful photos! You’re welcome! And thank you. We really had no idea what to expect, only that it was on the list. It exceeded our wildest expectations. So much beauty! So lovely. As I recall, though, the outside grounds were also impressive. Hope you’ll be posting some exterior photos, also? Yes, it was endlessly lovely. I’ll definitely be doing a more in depth post at a later date that will include outside pics. This is just a little appetizer 🙂 I was just so blown away by the endless intricate detailed beauty in every room that I had to share right away. Isn’t it! I love this kind of design. The colours are beautiful, and speak to me every time, but I think it’s also the symmetry that appeals to the part of me that wants everything organised and in it’s right place. Yes, gorgeous! Amazing patterns and colors and workmanship. And… my first question was, Do they sell a coloring book of it? LOL. P.S. I posted a link to this blog post to the ‘Coloring Inside The Lines’ group I’m part of on FB so people can get inspired by the patterns and colors. I was blown away by it all – the colours, the designs, the astonishing workmanship, the sheer joy that seemed to radiate from the creativity of it. Every room was different, and every one exquisitely beautiful. Thanks for sharing with your colouring group! Gorgeous photos! You have an amazing eye for detail. We were there last April–finally got Thom and Bea to Turkey–and they loved it as much as Eli and I did. I love looking at the details. And miniatures of anything! We both loved Turkey. Glad you finally got Thom and Bea to experience its wonderfulness. I can only imagine the excitement of seeing this as a whole. Awesome! It was fabulous. The whole place. We were slack-jawed and the wowing all over the place! Absolutely gorgeous. I can’t think of anything to say but “WOW”! That’s pretty much what we were saying too Silk. One wow after another. My best memory of the Topkapi Palace was of two Russian women who went behind a rope and had a guy take their photo. A guard ran over and shouted at them to run them off. It is a really beautiful place – great photos as always. Thanks Jeff. Oh too funny about the Russian women. One of my strongest memories of Versailles is a guard shouting at me for using flash. I just ran away. I didn’t know how to turn the flash off lol. Thanks Anita. 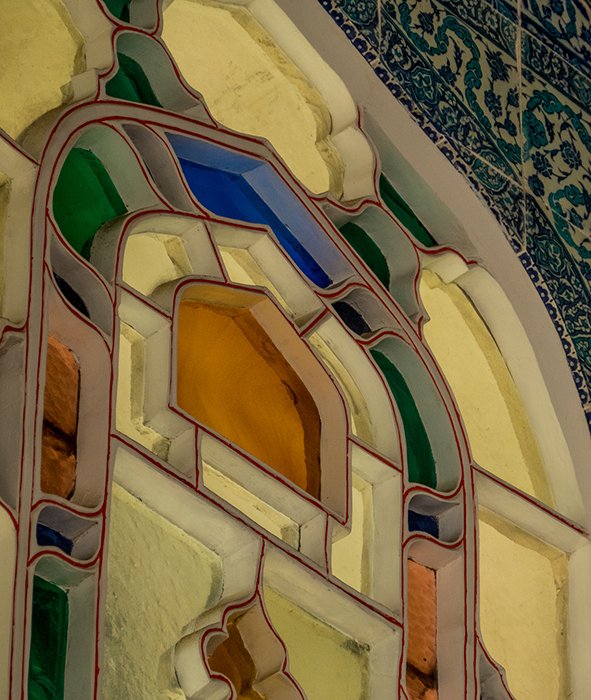 Topkapi is definitely one of the most gorgeous places we’ve been to. You have the right word – stupendous! There’ll be much more to come about Turkey. Wow wow wow Alison! Amazing photos! I am really dying to go to Istanbul. It has been on the list for ages. Someday!!!! Thanks so much Nicole. It is an amazing place. Every room we walked into our jaw dropped. So much beauty. There’ll be much more to come on Istanbul. What a fabulous city! I hope you get there. Thanks Ginette. In later posts I’ll include some wide shots, and some outdoor shots, but for this post I really wanted to focus on the detail. 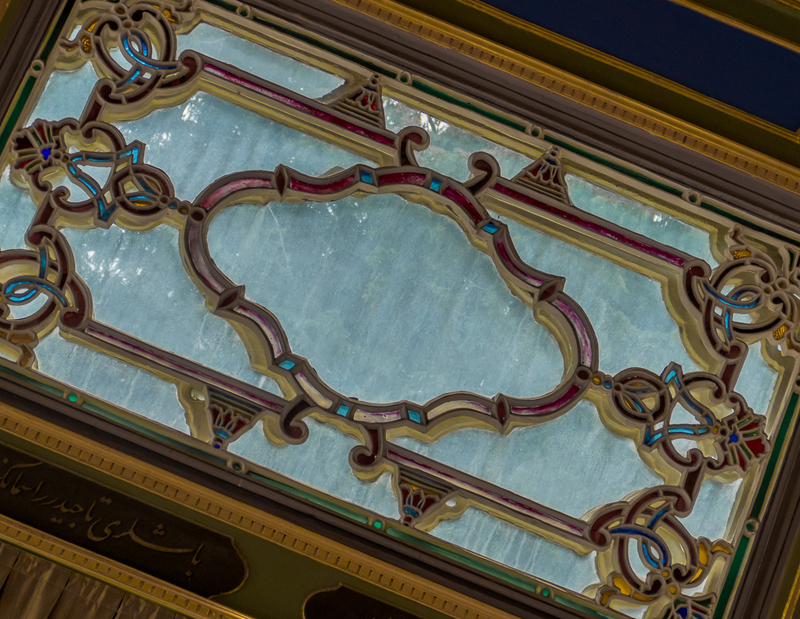 I was completely blown away by it, and was thinking a lot about the actual reality of creating it – all those master craftsmen – tile makers, painters, stained-glass window makers – each working at their art in such exquisite detail. I visited with my daughters in May – We found the Harem particular spectacular, many skilled hands created this treasure. The detail and colour is just spell binding. I would be “juiced” too!!! Thank goodness for the digital age I can imagine you took so many stunning photos, then it would be hard to sort the best of the best which you have shared with us. 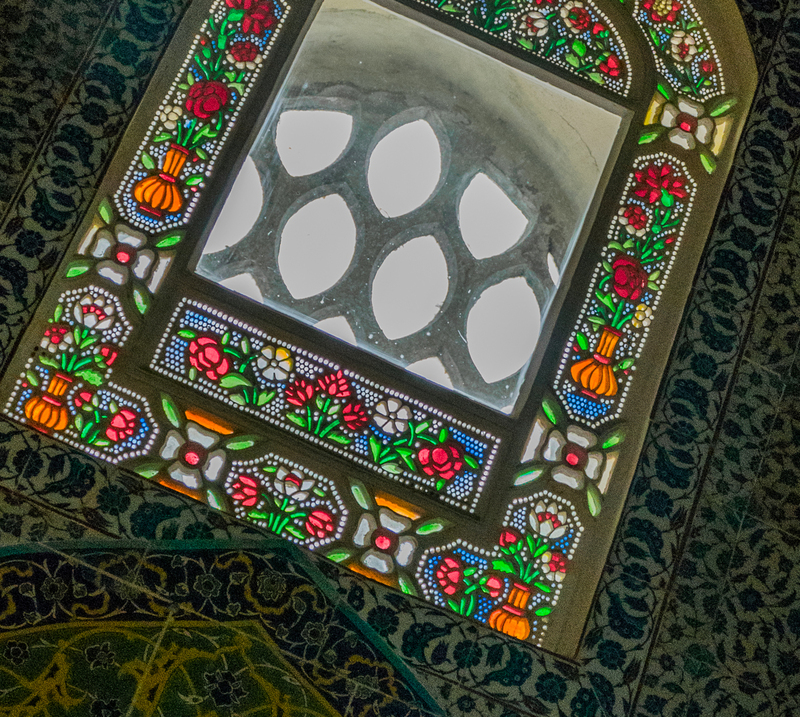 Love your photos of Topkapi’s details, Alison. It’s one of my favorite places in Istanbul and I would definitely go back in a heartbeat. Thanks Bama. 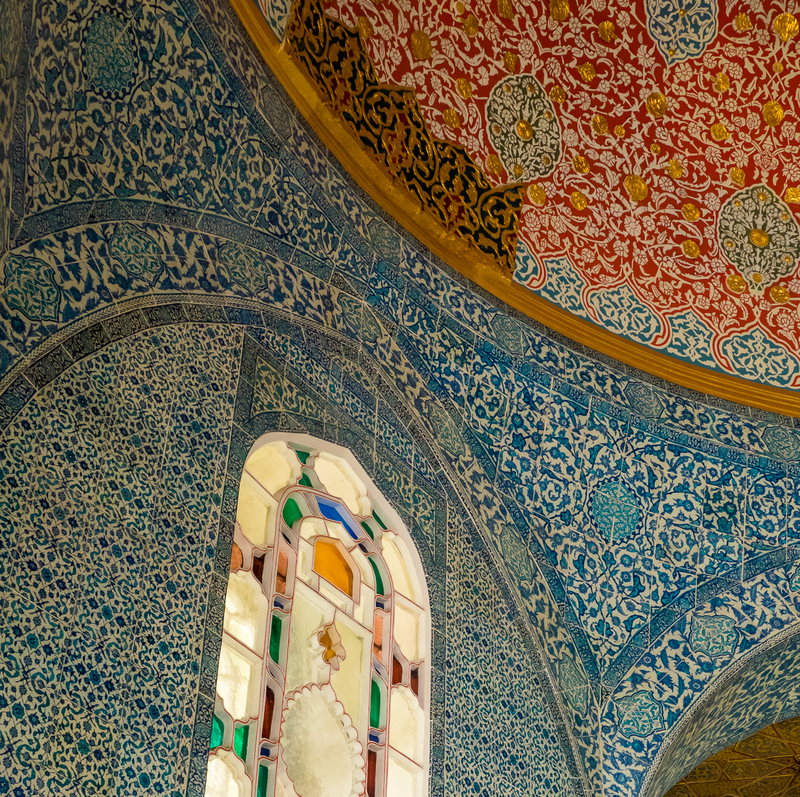 We were totally blown away by Topkapi – such a beautiful place. And we loved Istanbul. Beautiful indeed. I looked and don’t think any of these particular photos were of the floors? 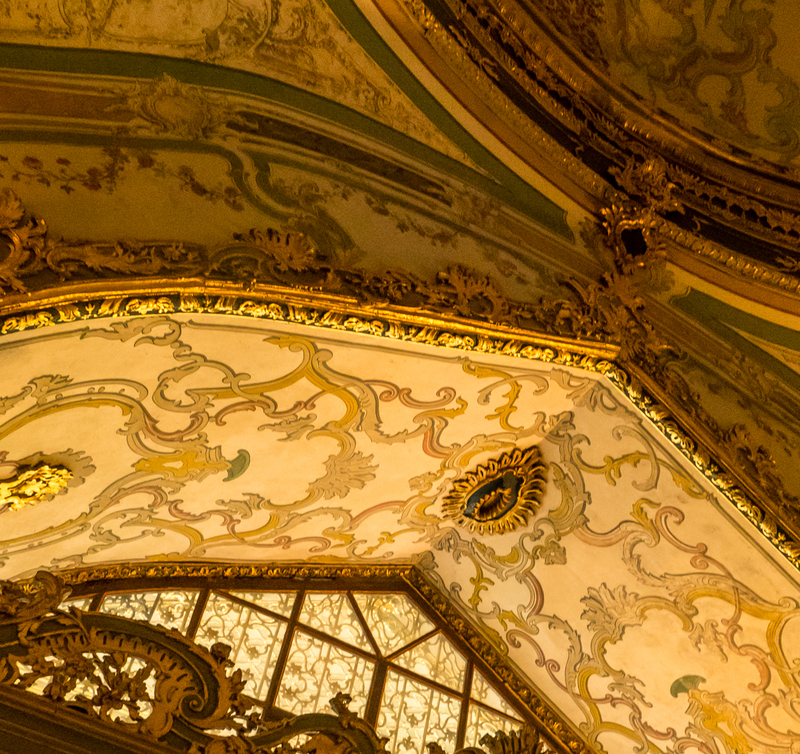 Are those equally stunning, or more subdued to keep one’s eyes looking upwards…? It is amazing just to think of the time spent selecting and blending colors, creating patterns to fit a particular space, etc. You realize they just about have to be unique creations, perhaps based upon particular principles. I like to imagine the team of painters resting outside on break, pointing to the sky, sharing a meal on makeshift tables in the middle of the work, or discussing some problem or nuance of the work. Thanks for the interjection of color and pattern! 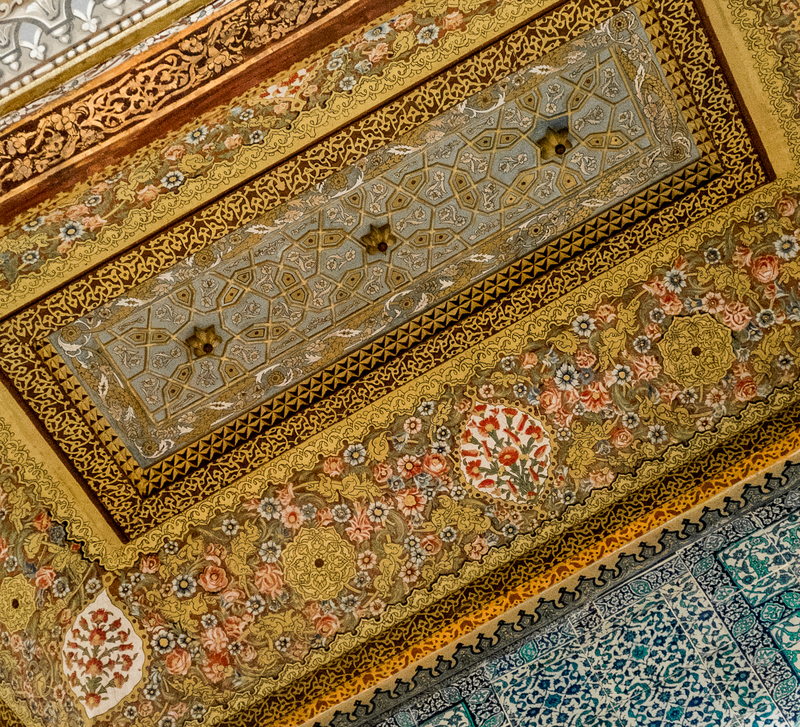 I had to go back to my photos to answer your question about the floors, and find that the few photos I have of floors are quite plain (marble probably), or covered in beautiful but subdued carpets, so yes, all the attention was on the walls and ceilings. I like your description of painters, making them so real, and it made me think of the tile makers, and then the chief who coordinated their production, and the master decorators who were given responsibility for certain sections of the palace, and so on. Istanbul… What a dreamscape. Hope that you are discovering unknown pleasures there. Istanbul is fabulous. We loved it. I’ll be putting together several posts about our time there sometime in the future. And yes, we discovered some treasures. We’re almost at the end of ten days in Jordan, and day after tomorrow go to Egypt for 2 weeks. The blog is always way behind. Och as someone who loves details.. I think I just entered heaven. Gorgeous gorgeous pics! Thanks so much M. I too love details, always amazed by them, always looking looking for them. Have you been to Madurodam? You must have! I’ve been totally offline, away from my blog and others. And I don’t see a “home” page on your site? Is this your most-recent post? Seems a while ago. Anyway, I’ve got some time and I’m here now. Love your photos, the details are very cool. What I remember most of Topkapi was a knife with an emerald handle, huge emerald. And of course, the harem was cool. I’ve never had a home page. My home page is the latest post – and this is it, and it is only a week old. Did you miss the previous one? I try to post once a week, but this time it will be 8 days. May have time to post a new one later tonight. Thanks re the photos. Its an amazing place. I remember a diamond – the biggest diamond I’ve ever seen. Huge! But I couldn’t photograph it. Yes, the harem is very cool. Got it. Mine is sorta like that. I guess mine is the blog itself. I just had to renew my premium stuff with WP, so was looking into upgrading to a paid theme. I know what I want, just haven’t found exactly the one. I want one that makes my photos look like your photos…and comes with a Don to help plan my trips. Totally get why you would be juiced about this place – amazing!!! Yes, amazing! We kept having to pick our jaws up off the floor. Isn’t it fabulous! We were overflowing with wows! So gorgeous. Ahhh, I loved this place!!! Despite the hoards of tourists, it was definitely a highlight of Istanbul. My boyfriend and I have actually been talking about teaching English in Turkey, so your Turkey posts could not have come at a better time! We loved it too – so much beauty. Definitely a highlight. There will be many more posts to come about Turkey over the next few months. Simply Stunning! The beauty of this place struck me hard and left me speechless. 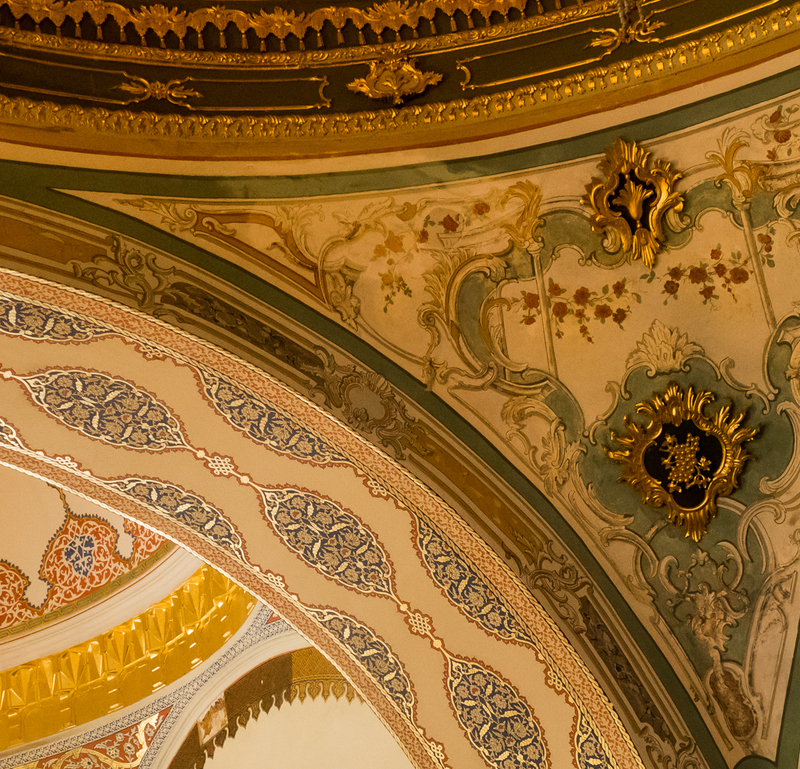 The marvelous design of the Topkapi palace depicts the excellent craftsmanship. Thanks for taking me to the beauty of this place with your adorable pictures. Thank you so much Debanjan. We were also speechless. Except for wow! We kept saying wow, over and over. It seemed to be the only word we could get out. Gorgeous craftsmanship. Thanks so much Terri. Yes, it’s quite magnificent. I’ll be definitely posting some exterior shots later when I get to writing about Turkey in more depth. We spent about 6 hours at Topkapi until we were so saturated we couldn’t take in anymore. Amazing place. Excellent post.Wish I can go there again.Apart from the place I find Turkish people extremely good looking.